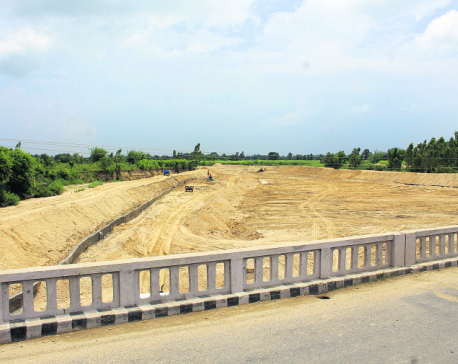 MAKWANPUR, Aug 6: In the name of asset, all he had was a small field. But the landslide triggered by the deadly earthquake of 2015 buried his field. A dilapidated hut, which protected him from heat and rain too was crushed by a rock later, compelling his family of seven to live a miserable life under the open sky. Since then, Kiran Bahadur Praja and his loved ones of Kankada in remote Makwanpur were struggling for shelter and food. Fortunately, the National Reconstruction Authority (NRA) listed his name as quake victim which gave him a huge respite. However, Kiran and his wife Lalmaya were in dilemma as they could not build a home in the same land since it was prone to landslide. The Chepang couple neither had any land elsewhere. Having no option, they started constructing a single-room house in the same land by taking two tranches of earthquake relief grant. In the meantime, the NRA offered them land in Sunachuri of Manhari Rural Municipality much to their delight. "Now we can build our home in a safer place," said Kiran who is originally from Rakshirang Rural Municipality-9, Kankada. He expressed his gratitude toward the government for the help. Similarly, Kuber Moktan of Rakshirang-4, Panjani is also delighted after getting a piece of land from the NRA. "As that was the only land we had, we could do nothing other than sheltering in the same land risking our lives," said Kuber. The happiness of Rammaya Praja of Rakshirang-7, Kankada knew no bounds after receiving a plot of land from the NRA. Rammaya and her husband were wandering from place to place in search of land as they were not ready to build home in same landslide-prone area. Fortunately, the government heard their plea and offered them land in a safer location. Altogether eight households of Rakshirang Rural Municipality including five Chepang families have received land for building homes. 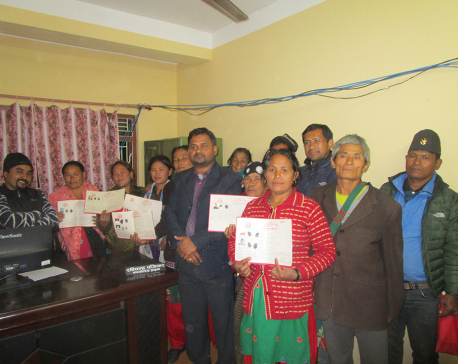 Likewise, two quake-affected families of Bakaiya Rural Municipality of Thingan too have received land ownership certificates. NRA purchased ten-dhur land in Chainpur of Rakshirang and Sunachuri of Manhari Rural Municipality for the displaced victims. As per the latest records, there are 33,266 quake victims in Makwanpur and 25,286 of them have signed the agreement for relief. Efforts are underway to relocate four more families of Rakshirang to safer place.